This pair is considered by a few brokers and traders to be part of the Majors, though it is not always the case. the NZD/USD is cross between the currency of New Zealand (New Zealand Dollar) and the currency of USA (U.S Dollar). Forex and binary options traders also call this pair the 'Kiwi'. When carrying out currency trading activities in binary options, a trader will look at the market price of the pair that he/she wishes to trade, after compiling a relevant NZD/USD forecast. A market rate for the NZD/USD pair of 0.8682 means that it takes 0.8682 U.S Dollars to buy 1 New Zealand Dollar. Much like any other currency pairs which are affected by external factors, NZD/USD is influenced by the interest rate disparity between the U.S federal reserve and the Bank of New Zealand. The U.S Federal Reserve can take a decision to move in a particular way and alter the open market with the intention of bolstering the U.S dollar – thus making the pair’s market value decrease. Alternatively, the Bank of New Zealand could take necessary measures to bolster the NZD, which would make the currency pair rise in value. It is important to remember this when carrying out currency trading activities on this pair. The NZD/USD pair tends to be positively correlated to currency pairs which have the USD as a quote currency, such as AUD/USD, EUR/USD, and GBP/USD. 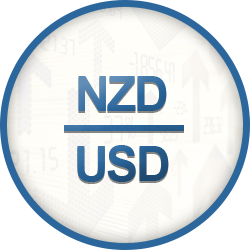 Gathering data by conducting analysis is extremely important when performing currency trading on live markets, which is why this page offers you all the resources necessary to compile a comprehensive NZD/USD forecast.